The Dolina Quartet was formed in September 2013, while all members were studying at the internationally renowned Chetham’s School of Music. Over the last three years the ensemble has earned a reputation as a promising group of talented young musicians and they have performed on many stages across the UK. Exploring a rich amount of repertoire from Barber to Shostakovich, The Dolina Quartet has also premiered pieces by up and coming contemporary composers. Other highlights include full performances of Weber’s Clarinet Quintet and Mozart’s Dissonance Quartet in a ‘Chamber Essentials’ Concert. The group have received chamber coaching from distinguished names such as Mark Messenger, Melissa Phelps and Simon Rowland-Jones and all members are currently studying at the Royal College of Music. 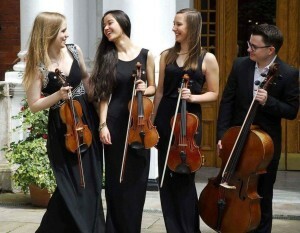 The Dolina String Quartet are ideal for weddings, corporate events, parties, ceremonies and recitals.